Want to Calculate Mortgage Payments Offline? 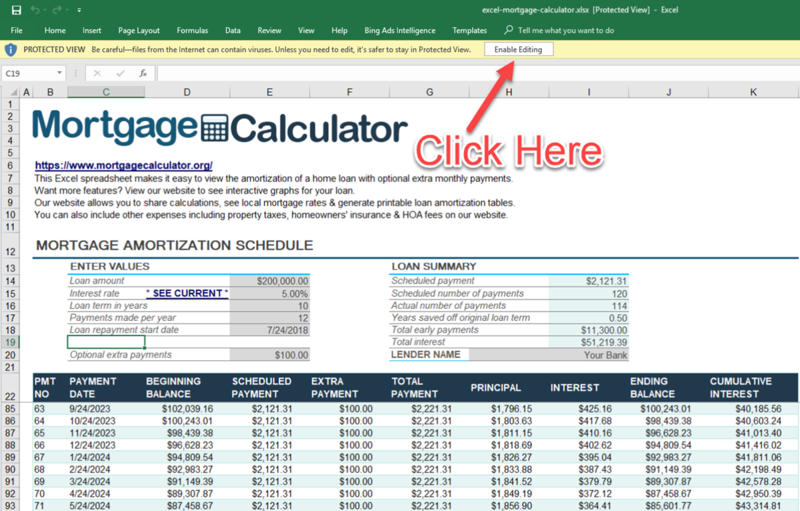 We have offered a downloadable Windows application for calculating mortgages for many years, but we have recently had a number of people request an Excel spreadsheet which shows loan amortization tables. The calculator updates results automatically when you change any input. loan amount - the amount borrowed, or the value of the home after your down payment. interest rate - the loan's stated APR. loan term in years - most fixed-rate home loans across the United States are scheduled to amortize over 30 years. Other common domestic loan periods include 10, 15 & 20 years. Some foreign countries like Canada or the United Kingdom have loans which amortize over 25, 35 or even 40 years. payments per year - defaults to 12 to calculate the monthly loan payment which amortizes over the specified period of years. If you would like to pay twice monthly enter 24, or if you would like to pay biweekly enter 26.
loan start date - the date which loan repayments began, typically a month to the day after the loan was originated. optional extra payment - if you want to add an extra amount to each monthly payment then add that amount here & your loan will amortize quicker. If you add an extra payment the calculator will show how many payments you saved off the original loan term and how many years that saved. TIP: When you download Excel spreadsheets they will download in PROTECTED VIEW. You need to click on the [Enable Editing] button in the yellow banner at the top of the spreadsheet to change variable amounts. Right click on the following image to save a copy of our Excel loan calculator spreadsheet, or click on it to directly open it. By default this calculator is selected for monthly payments and a 30-year loan term. A person could use the same spreadsheet to calculate weekly, biweekly or monthly payments on a shorter duration personal or auto loan. The following table shows locally available mortgage rates which you can use to help calculate your monthly home loan payments.